Not so many people where Usa-River, the town which is the headquarters of Meru District, acquired its name. But it is an undisputed fact that Usa-River is town which was inspired by the international training centre established by Denmark in association with the government of Tanzania. East African Community (EAC), Kiswahili is currently being packaged at the MS-TCDC’s and sold to European countries as well as the United States of America. “Export here does not have to mean physically shipping goods or products abroad, but as far as our ‘selling’ of Kiswahili is concerned, it also means selling the language to foreigners, who actually come here to learn it and take the knowledge with them,” explained Dr Suma Kaare, the new MS-TCDC principal. “And our training center has been selling Kiswahili abroad for the last 40 years earning the country between US $ 500,000 and US $ 600,000 per year, and that is just from our center, you can therefore imagine how much Tanzania can make from the language if serious efforts were to be made nationwide to market Kiswahili around the globe,” pointed out Dr Kaare. The US $ 600,000 that the MS-TCDC makes yearly from exporting Kiswahili translates into around 1 billion/- annual income from the National language produced at just one training center. The global interest in learning Kiswahili is very high and keeps increasing, we are receiving students from the United States, United Kingdom, Germany, Sweden, Denmark, Japan as well as a number of African countries such as Nigeria, South Africa and Uganda. Like Tanzania, Kenya also regards ‘Kiswahili’ as the country’s national language but most Kenyans still struggle to grasp, let alone master, Kiswahili therefore the country has also been sending a number of students to learn the language from the Usa-River based centre. “You cannot run for any public office in Kenya, including political positions without first passing the ‘Swahili’ test, it has thus become a matter of life-and-death for Kenyans to learn the language signaling a new demand and market base for Kiswahili,” said Dr Kaare. At the time of the interview the center was training nearly 30 students from the University of Minnesota and Michigan University, both based in USA. We managed to talk to one of the foreign students, Ms Ulrike Doerr from the Kiel University of North Germany. Ms Doerr teaches at the Germany University and said she always loved the language. “Very few people speak Kiswahili in Germany but I was inspired to learn the language after meeting a number of Tanzanian who seemed to be very nice people such that you just feel like wanting to learn both their language and culture,” she said. The MS-TCDC principal, revealed that, every year the center train over 500 Swahililearning students from around the world and the courses duration ranges from one-week to six weeks and come under various packages. “Many intend to work as community or social workers in African countries, other plan to teach the language in their own countries but there are others who already work in Tanzania, Kenya and Uganda,” said the Principal. The Kiswahili courses fall under the ‘Swahili and Language Cultural Skills,’ which comprises of Intensive Swahili for Beginners, Intensive Kiswahili for intermediary level, Swahili for beginners, and Swahili for Intermediary as well as Kiswahili Advanced. Defence Minister Shamsi Vuai Nahodha once served as Kiswahili teacher at MS-TCDC while former Chief Justice Augustino Ramadhani had also taken Kiswahili courses at the centre. But in addition to Kiswahili, the Usa-River based centre has been offering variety of other training courses including ‘Leadership and Management skills,’ ‘Conflict Resolution and Peace building,’ ‘Development Studies,’ ‘Anti-corruption and transparency,’ ‘Gender and Women Rights,’ ‘Human Rights’ and ‘Child Rights Advocacy.’ Other courses offered at the center are, ‘Land-Food Rights and Climate change,’ ‘Natural Resources Management and Governance,’ Policy Analysis and Advocacy,’ ‘Civic Empowerment and Social Movement,’ as well as ‘Sustainable Agriculture and Trade Justice. The MS-TCDC also offers tailor-made courses for institutions, organizations and companies. In other words it is a fully-fledged ‘University,’ but one with an international approach to training programs. “Every year we train over 1,700 students from all over the world and 60 percent of these are foreigners,” said Dr Kaare adding that the center has played an important role of ‘bringing the world to Tanzania,’ and serving as melting pot for different cultures. But Dr Kaare is concerned with high visa charges that foreign students are subjected to pay when coming to attend schools in Tanzania; “It is okay to charge them for Visas but the US $ 500 imposed to them is rather too high for students because many of them are sponsoring themselves,” she stated. From next year (2013) the center intends to establish Diploma courses for Swahili trainers who intend to teach the language in other schools and colleges. 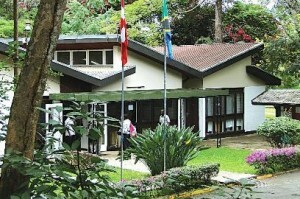 The move is in line with the expected rise in the demand for Kiswahili to be fueled by introduction of such courses in a number of universities around the world, the African Union which has also adopted Kiswahili as its official language and countries like Rwanda and Burundi that also want to take Kiswahili under their wings.